Momiji Tunnel(もみじ回廊) is a beautiful Koyo spot located on the side of Lake Kawaguchi, Yamanashi. The beautiful Autumn leaves of Momiji create a beautiful tunnel. 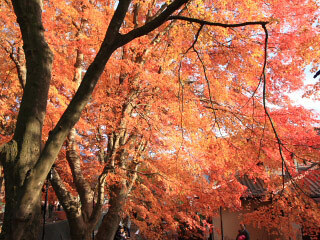 From the middle to the end of November, you can enjoy Koyo. During the Koyo season, it has a beautiful Lit-up Koyo. During Koyo season, there are Koyo Festival. Lit-up: From Sunset to 10 p.m.
1. There is a shuttle bus to this tunnel. Momiji Tunnel is one of the best Koyo spot at Lake Kawaguchi. From November 1 to 24, there is Koyo Festival that sales the local products.